Mankind first stepped foot on the Moon on 20 July 1969, achieving what is arguably humanity’s greatest ever feat of exploration. For two and a half hours, Neil Armstrong and Buzz Aldrin explored the lunar surface on foot while Michael Collins piloted the Apollo 11 orbiter around the Moon. But what do you say when someone insists that the Moon landings never really happened? This Top 10 list will explore some of the greatest conspiracies and give explanations. #10 Reason for No Stars in Moon Landing Pictures. Speaking of the flag photographs, it’s often pointed out that there are no stars to be seen in the background! This is actually a common feature of photographs from space, where the contrast between light and dark is extreme. The surface of the Moon reflects the strong sunlight and appears very bright in photographs. This brightness drowns out the relatively dim light from stars in the dark sky, akin to how car headlights can drown out the fainter light from nearby objects. The human eye can adjust and pick out the stars, but unless it’s set to the right settings, a camera struggles with the contrast. Astronauts on the International Space Station today regularly take photographs of the Earth that show a completely starless background, but it’s the same problem of contrasts at work. #9 Why did the Flag flap on the Moon? From photos and video, it appears to that the flag placed by Neil Armstrong and Buzz Aldrin is flapping in the wind. If there is no air on the Moon so how can it flutter?! The truth is that the flag isn’t flapping. If you look closely at the gif to the left, the flag is in the same position between two frames as the astronaut moves. There is a horizontal rod projecting from the post at the top of the pole to hold the flag unfurled. The flag was disturbed as it was planted into the ground and kept this bent shape because of the lack of strong gravity on the Moon. In video footage of the flag being planted into the Moon’s surface, it also appears to wave back and forth. 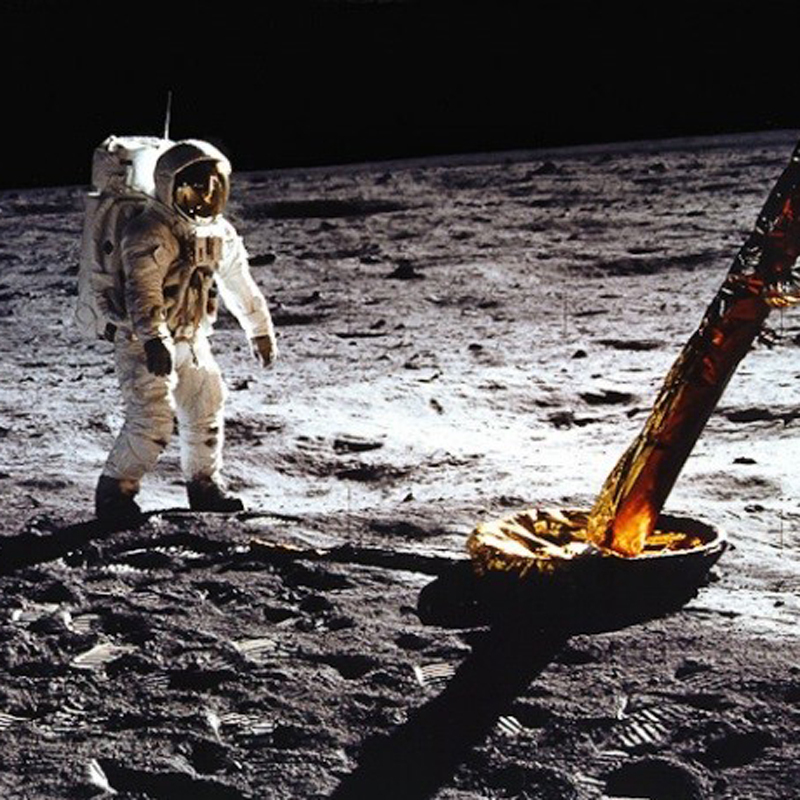 This is because when the astronauts were planting it, they rotated it back and forth to better dig into the lunar soil, which of course made the flag ripple as it swung like a pendulum- without a breeze. The image on the top left was taken by the Apollo 15 crew in 1971. The image below is a 3D visualisation from several photographs captured by a Japanese lunar orbiter called SELENE in 2008. The camera on SELENE didn’t have the resolution to capture individual rocks, but the two images are obviously of the same terrain in the same scenery, from lunar missions separated by 37 years and directed by space agencies from two different countries. SELENE also captured images of the halo of lunar dust created from the Apollo 15 lunar module exhaust. It is often claimed that if we really landed on the Moon, then it should be fairly easy to see the evidence with a telescope such as Hubble. But as powerful as Hubble is at spying galaxies, it simply doesn’t have the resolution to pick up fine details like spacecraft on the Moon – they’re too small and the Moon is too far away. Thankfully, we do have a closer spacecraft, NASA’s Lunar Reconnaissance Orbiter, which has been in orbit around the Moon since 2009. And it has captured recent photographs of all the Apollo landing sites (see here and here). These images show the Apollo spacecraft in exactly the right locations and amazingly, you can even see the astronauts’ footprints as they explored their lunar home. These landing sites have also been independently spotted by a variety of other spacecraft from China, India, and, as discussed above, Japan. #6 Why was there a Rock labeled ‘C’? The infamous labelled rock from the Apollo 16 mission. Movie props are often numbered and lettered so that stagehands know where to place them. But in fact, the label simply isn’t there. The image of the rock is taken from a much larger shot of the Moon’s surface, and if you look at the original image (shown above left), the marking isn’t there. Either a small hair or piece of thread must have got caught in the machine while it was being copied (image above right). #5 Why are there Strange Shadows in Footage? One of the subtler arguments against the Moon landings has to do with non-parallel shadows. If the Sun is the only source of light, why do some shadows appear to point in multiple directions? For example, in the picture on the left, the astronaut’s shadow matches up with the lander’s, but there seems to be another shadow from the lander foot pointing towards the astronaut. Actually, a rough, uneven surface can cause all sorts of shadows at different angles, even with a single light source like the Sun. This something that can be easily experimented with at home. The combination of the Moon’s rough surface and the long shadows from a Sun low in the sky can easily create complicated shadows. The funny shadow in the picture above is likely created by an uneven ridge that extends towards astronaut and a low-angle Sun. #4 The Moon Landing was Filmed at a Sound Stage and a remote desert. During the Apollo 15 mission, David Scott did an experiment by dropping a hammer and a falcon feather at the same time. Both fell at the same rate and hit the ground at the same time. This proved that he was in a vacuum. If the landings were filmed outside in a desert, heat waves would be present on the surface in mission videos, but no such heat waves exist in the footage. If the landings were filmed in a sound stage, several anomalies would occur, including a lack of parallax, and an increase or decrease in the size of the backdrop if the camera moved (footage was filmed while the rover was in motion, and yet no evidence of any change in the size of the background is present). People have cited the relative level of the United States and USSR space technology as evidence that the Moon landings could not have happened. For much of the early stages of the Space Race, the USSR was ahead of the United States, yet in the end, the USSR was never able to fly a manned craft to the Moon, let alone land one on the surface. However, most of the Soviet gains listed above were matched by the United States within a year, and sometimes within weeks. 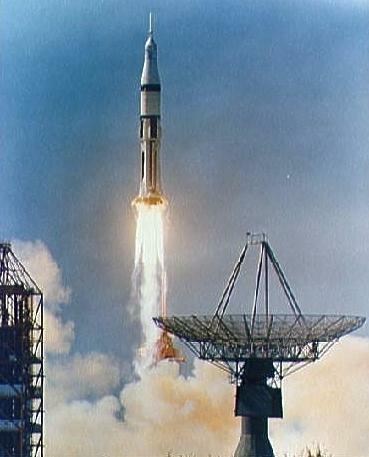 In 1965, the United States started to achieve many firsts (such as the first successful space rendezvous), which were important steps in a mission to the Moon. Furthermore, NASA and others say that these gains by the Soviets are not as impressive as they seem; that a number of these firsts were mere stunts that did not advance the technology greatly, or at all. In fact, by the time of the launch of the first manned Earth-orbiting Apollo flight (Apollo 7), the USSR had made only nine spaceflights (seven with one cosmonaut, one with two, one with three) compared to 16 by the United States. In terms of spacecraft hours, the USSR had 460 hours of spaceflight; the United States had 1,024 hours. #2 Van Allen Belts would have Fried the Astronauts! 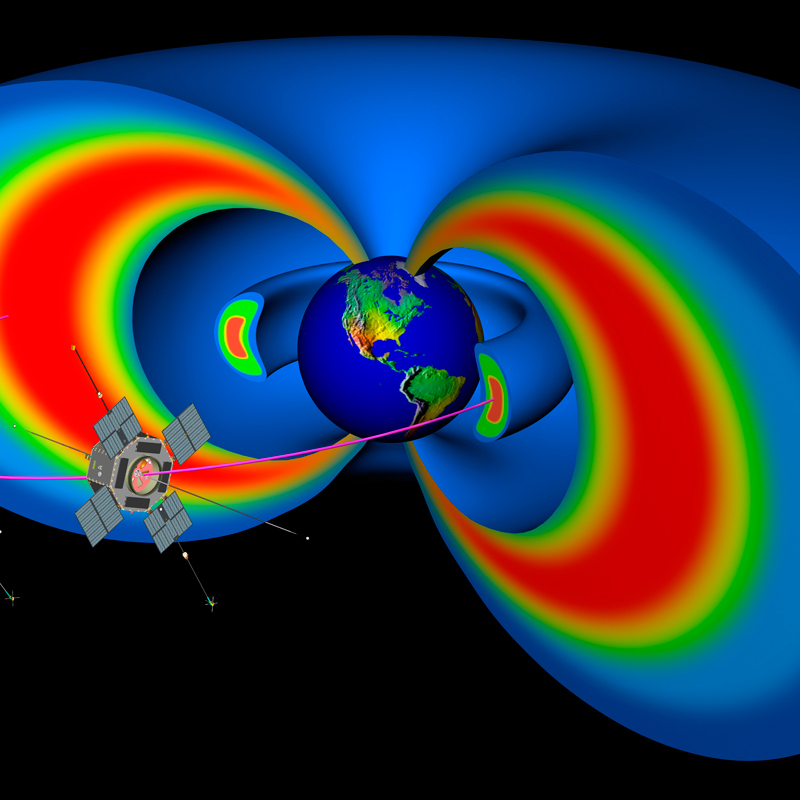 One of the most popular theories as to why the Moon landings couldn’t have happened has to do with something called the Van Allen belts. These are two huge belts of radiation that surround the Earth, shaped by Earth’s magnetic field and pounded with high-energy particles from the Sun’s wind. It’s been claimed that humans couldn’t have passed through these belts without being fried with lethal doses of radiation. Radiation sickness occurs when you have been exposed to around 200 to 1000 ‘rads’ of radiation within a few hours. The Apollo 11 crew were within the belts for less than two hours during their journey to the Moon, and so would have only been exposed to an estimated 18 rads – well within the safe limit. There can still be some adverse effects from even this level of radiation, so NASA made sure that the Apollo 11 spacecraft was well-insulated such that the average dose of radiation over the 12-day mission was just 0.18 rads, or similar to the radiation dosage from a chest X-ray. #1 We have Moon Rocks! Finally, we have the proof that the Moon landings actually happened right here on Earth, in the form of Moon rocks. The image on the left is a glass spherule, of which many were found in the 382 kilograms of Moon rocks that were brought back by the Apollo crew. On Earth, the elements quickly break down any volcanically-produced glass. But in space, glass spherules survive nearly pristine. When the first rocks were returned from the Apollo 11 mission, samples were given to 135 different countries around the world as a gesture of good will. These rocks have withstood every possible geology test from labs around the world, and these have confirmed they are indeed of lunar origin. As soon as you say “proofs”, you’re an utter idiot. evidence or argument establishing or helping to establish a fact or the truth of a statement.